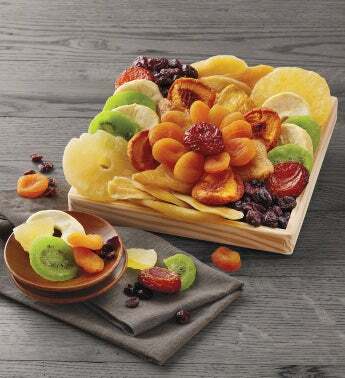 Our Dried Fruit Tray elevates dried fruit to a whole new level. This is a unique gourmet gift filled with fabulous dried fruit in an exotic array. Unusual fruit such as candied kiwi and dried tart cherries nestle against pineapple rings, mangoes, and Mediterranean apricots. Send a premium fruit gift that shows you have a flair for seeking out the unusual, going beyond the expected fruit tray.